The piece “Tips on mining law review” featured below was initially published in Malawi’s Mining Review Issue Number 16 2014 that was circulated in September 2014. We also wrote about the Mines and Minerals Act Review symposium here. As Malawi is reviewing its mining legislation, stakeholders have said there is need for Malawians to maintain a culture of investor tolerance if the country is to enormously benefit from its mineral wealth. 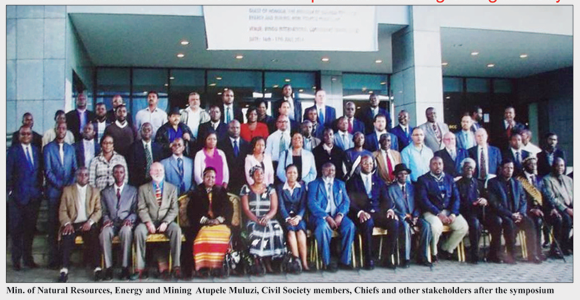 Stakeholders, who presented their views in light of the symposium to review the 1981 Mines and Minerals Act held on July 16 and 17 in Lilongwe, say there is need for all stakeholders including civil society groups to join hands in developing the minerals sector. Malawians have to understand that a single medium scale mine such as Kayelekera Uranium Mine cannot transform all members of the country’s population into millionaires. They also have to understand that though they invest their money to make profits, mining companies follow internationally recommended practices to protect the environment and take care of mining communities so there is no way a company of international repute can come to Malawi and indulge in activities that harm the mining communities or the environment. The mining executive, who does not want us to reveal his identity, says Malawians have to understand that countries in the region are competing for investment hence ill treatment or bad publicity against mining firms will prompt them to shun the country. Former Minister of Natural Resources, Energy and Mining Grain Malunga agrees with the investor’s comments hinting that while maintaining a conducive macro-economic environment for mining investment, there is need for the country to develop a stable regulatory framework that provides for the transparent and even handed treatment of investors. Malunga also says the new law should have a provision for a stable, competitive and fair fiscal regime that will ensure a sustainable environment and equitable sharing of the financial and developmental benefits of mining between investors and relevant stakeholders including the local community. He also recommends that the law should facilitate public-private partnerships that will help ensure that mining ventures achieve mutual interests for both the government and private investors. He also calls for a provision on Corporate Social Responsibility through Trust Funds or annual budgets which will help finance projects in mining impacted communities through public private partnerships. Malunga also advises the framers of the new law not to completely ignore what is in the Mines and Minerals Act (1981) but look at revisiting a number of areas including ownership of minerals. He recommends that ownership of minerals should be by the State and the minister responsible for Mines should have an exclusive mandate to grant mineral rights on the advice of a technical committee or Minerals Commission constituted by the Ministry. He also says fiscal regime applicable to the mining sector needs to be outlined in the Act and recommends 3% to 6% mineral royalty rates based on gross value of minerals sold. Veteran geologist and former Deputy Director of Geological Survey Department John Nkhoma agrees with Malunga saying besides taking care of the needs of the government and mining communities, Malawi’s laws need clauses to protect the interest of investors, who risk their capital to make profits. Small-scale and artisanal miners also have their share of comments on the law review. Mzimba Gemstone Miners say there should be a law mandating the geological survey to confirm the parcels of stones declared for export. Right now there is no such arrangement which gives room for cheaters to declare low quality gemstones thus of less value and later replace them with stones of higher value when exporting and as a result the government loses out. He also says the 10% royalty rate for gemstone miners is higher compared to other contries in southern Africa so the revised Act should consider a better rate for the miners. Malawi has existing mines for coal, uranium, gemstones, limestone, quarry, gravel sands and gemstones, and has awarded concessions for exploration of gold, platinum group metals and hydrocarbons.